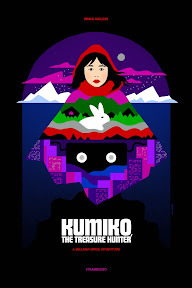 Kumiko, the Treasure Hunter may be based on a true-ish story – not unlike the '90s Coen brothers classic that inspires Kumiko (played by Oscar nominee Rinko Kikuchi) to travel from Japan to North Dakota in search of the movie's fictional buried fortune she's mistaken for factual cold hard cash. However (and fittingly) just like Fargo, this irresistible oddity hot off the festival circuit from the Zellner brothers is unlike anything you've ever seen. Mind-boggling from the beginning, Kumiko’s filmmakers place equal importance on their heroine’s quest-driven narrative (of the Don Quixote variety) as they do on the gentle culture clash comedy that occurs when the woman who was already a fish-out-of-water in her own country arrives in a new frozen land filled with friendly people that don't speak her language. Yet in a testament to the strength of the screenplay from start to finish, some of Kumiko 's most intriguing plot points are established early on in the picture when we get a glimpse of her professional life. An "over the hill" Office Lady at the age of twenty-nine whose boyfriend, beauty, and baby obsessed cliquish colleagues treat cubicle duty as a hobby on par with getting a 1950s style collegiate "Mrs" degree so they can trade the office for kitchen, the socially awkward Kumiko spends her spare time searching for lost treasure "like a Spanish Conquistador." Having unearthed a battered old copy of Fargo on VHS in the film's opening scene, Kumiko studies the tape diligently, making a hand-stitched map of Steve Buscemi's onscreen booty. But after she's busted trying to "borrow" a reference book that contains a map to her destiny at the local library, Kumiko’s search is nearly squashed before it’s begun. Enchanted by her conviction, resolve, and creativity – not to mention unwilling to be the one to tell her that her mission is futile – the library's loss prevention officer becomes her first ally, quickly ripping out the required page and sending her on her way. And par for the paradigm, he's just the first of many Joseph Campbell inspired supporting characters – including stellar cameo turns by each Zellner brother – that take on various audience surrogate-like roles for Kumiko during her classical journey to that snowy Fargo fence. A gender flipped indie Indiana Jones, in Kumiko, the Treasure Hunter, a woman gets to play conquistador instead of settling for the role of conquistador's girlfriend or their romantic reward. And much like Kumiko, those in even the tiniest roles are given surprising amounts of depth in a work that truly champions the basic good in people as much as Fargo explored the opposite psychological terrain. But rather than give us a matinee idol, co-writers Nathan and David Zellner – together with actress/producer Kikuchi – opt to center the story around a fully formed and admittedly flawed individual without preface or prejudice. For while we worriedly watch and wonder where it'll all head, the Zellner brothers wisely avoid defining or assessing Kumiko's mental health, despite offering us a few breadcrumb style context clues here and there that go along with the refreshingly uncynical approach. Letting us into the storyline initially through her eyes alone before pulling back to reveal the point-of-view of others is a surprisingly bold structural gamble that pays off well. Viewed in a certain light, one can even go as far as to call the film a feminist allegory in that by escaping the societal pressures of marriage and family, Kumiko shows us that "Office Ladies" can do more than fetch coffee as repeatedly, people bring her a symbolic warm beverage in her new surroundings. Boasting a playful score that musically echoes its inspirational Fargo source material, that's where most of the similarities end for director David Zellner's heavily symbolic, humanistic film. A kindred spirit to Amelie, Life is Beautiful or Broken Flowers, the film by the Zellner brothers revels in its status as a creatively spun tall tale. As such, Kumiko employs its own cinematic language in order to bridge together the Japanese and English dialogue of its characters. Although the existential film is full of people that cannot understand one another, from start to finish they are nonetheless united by the heroine's inalienable right to find her way in the world by choosing her own adventure. Adhering to the century's old "down the rabbit hole" quest paradigm that propels the film – like Kumiko – from Point A to Point B as if on a map, the Zellner brothers deftly balance the comic and the tragic throughout. Never wandering too far away from the recurring theme to stand by your own impossible dream, Kumiko, the Treasure Hunter leads us toward a majestically well-earned resolution that's movie gold.